Yes, the time has come for me to make a cover for Rhymer. The recording process for the podiobooks version starts this weekend, and (assuming they accept the project) I need to get the associated image ready. 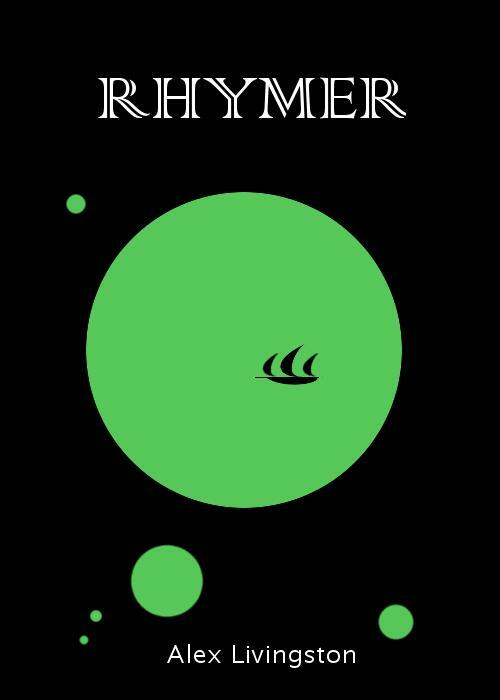 Rhymer is a retelling of an ancient Irish imram (seafaring wonder voyage myth) set in a sci-fi space universe. My goal is to convey this in an image. Green circles = space, right? And a sailboat where a spaceship would be = something unusual and ancient is afoot here. My first draft of the complete cover keeps with the minimalist thing. The font looks like 70’s mythology text to me, very D’aulaires’. I used this as the cover for the proof copies I Lulu’d up to make editing and proofing easier. It looked OK, but much more suited to online. For draft #2, I poked around for 60’s and 70’s book covers to see what the masters did. And yes, I added a distressed look because I am a book nerd. The drawing for the logo is taken from one of a hanafuda cards. Chance, games, and weather play major parts in the book, so the Rainman card seemed a natural choice. Of course, e “covers” don’t really need all the same stuff that RL covers do. Like, ya know, words and all that. Perhaps I’ll end up just using the “icon” version. Hmm…. 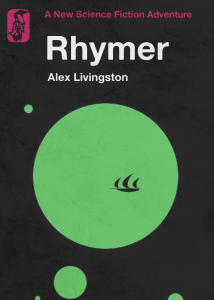 This entry was posted in Uncategorized and tagged cover, rhymer on May 20, 2011 by gala5931. I approve. Circles do = space, I say. It even makes me think of the huge solar system mobile my teacher hung in our 4th grade classroom. Circles also = water, though, which I think completes the connection of your nautical story re-told in space.